Here we go again on Fishing in the Discount Bin. You know the drill by now. I watch a movie, and blog about it. It's just that easy. 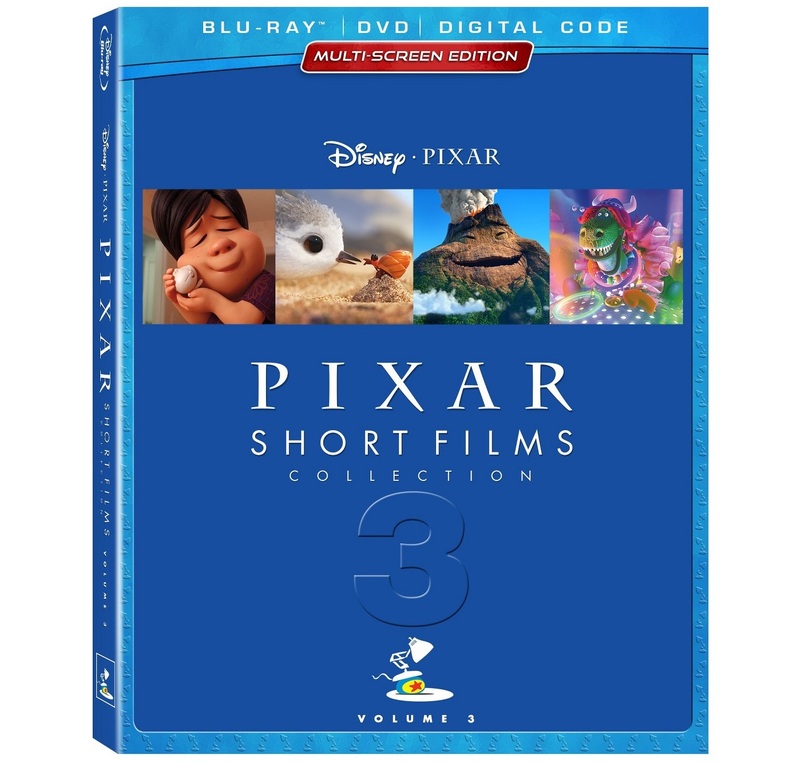 Today, I continue my love of Pixar with The Pixar Short Films Collection Vol. 3. This is originally in my notes at December 1, 2018. Man o man, have I really been doing this blog for more than seven years now? As I sat down to write up this review, I decided to look up my notes on The Pixar Short Films Collection Volume 2, and I saw that I shared that one in 2011. In that review, I saw that Volume 3 would probably be along in 2017. I was off by a year, but here we are. As I originally said in my reviews of Volume 1 and Volume 2, Pixar's shorts have become almost as famous as their theatrical films. They've become a great opportunity for upcoming Pixar animators to strut their stuff, as well as serving their original purpose as being a test bed for their newest animation software. See, Pixar began way back in the early-1980s as the computer animation R&D lab of the legendary special effects studio Industrial Light and Magic. The very first thing that Pixar produced was the Genesis Planet computer simulation in Star Trek II: The Wrath of Khan. By the mid-1980s, George Lucas decided he'd gotten all he was going to get out of it, and decided to close it down. The staff, led by pioneering computer scientist Ed Catmull and former Disney animator John Lasseter, felt they were on to something, and didn't want to see it end. So, they found a new investor in the form of Steve Jobs. Jobs bought the outfit, and re-named it Pixar. But for the rest of the 1980s, Jobs kept their focus on being a computer R&D lab. Their biggest accomplishment was a 3D medical scanner that could produce highly-detailed 3D images of a person's interior, but it was so ridiculously expensive that only about three hospitals ever bought it. While all this was going on, though, Pixar kept cranking out animated short films to showcase their newest advancements. And something funny happened. Those short films started winning Oscars. Hollywood started taking notice. As Lasseter said in the documentary The Pixar Story, "[The short film department] was 1% of the budget, but 99% of the visibility." In 1990, Steve Jobs finally figured it out, and restructured the company into an animation studio. Pixar already had an in with Disney, what with Lasseter being a former animator, and with Pixar helping Disney develop their CAPS program...the computer system that Disney used in the 1990s to crank out all their films. So Pixar signed a deal with Disney, and the rest is history. Pixar began the tradition of attaching short films to all their feature-length films with A Bug's Life in 1998. Their short Geri's Game won the Oscar for Best Animated Short, so they wanted to show it off. And it's become a proud Pixar tradition. So what's on their latest compilation? The Blue Umbrella - Ha! Again, when I looked up my review of Volume 1, I note how this one was going to be in theatres in front of Monsters University, and that it would no doubt be the first film on Volume 3. And I was right! So you know there's that phenomenon where people see faces in every day things? This makes a movie about that. On a rainy city street, a blue umbrella and a red umbrella fall in love with each other, and so the various faces on the street conspire to get them together. It's romantic as hell, and I forget what a great soundtrack it had until Volume 3 used it for their menu screen. The Legend of Mor'du - This one was originally a bonus feature on the Brave Blu-Ray, and it's a nice little piece of universe expansion. We learn the origins of Mor'du, the demonic bear who serves as the villain of our film. This one is animated differently, though. It's mostly limited 2D animation, with the lush 3D animation that Pixar is known for being saved for the opening and closing. It's good. Partysaurus Rex - It's a Toy Story short! I like it when these shorts expand the universe, and this one focuses on bathtub toys. Bonnie (the little girl who inherited Andy's toys at the end of Toy Story 3), takes Rex the dinosaur into the tub with her one night, where Rex gets to meet all the tub toys. Turns out it's a sad existence for tub toys, as they only really live when the tub is full of water and they can float. Rex, having recently earned the nickname "Party Pooper Rex" from the other toys because of his nervous habits, decides to turn himself into "Partysaurus Rex" and uses his arms to turn the taps on and fill the tub. And then about 80% of the short is an EDM music video as all the tub toys have a rave. It's just fun. This was originally in theatres in front of the 3D re-release of Finding Nemo. Party Central - Here's a first...a Monsters, Inc short. Oh, no wait. There was Mike's New Car on the Monster's Inc DVD. Never mind. Anyway, this one is pretty much a deleted scene from Monsters University, as Sully and Mike throw their first frat party. They use the doors to the human world as a portal to start sneaking food, guests, and booze from other parties. This actually makes for some pretty good slapstick and makes for a pretty funny short. This was originally in theatres in front of Muppets Most Wanted. The Radiator Springs 500½ - Oh, yay. Another Cars short. Man, Cars shorts has been a lucrative franchise of its own, with Pixar having cranked out 15 of them. They've got their own compilation disc, which is the only Pixar film I don't own. Anyway, this is #15, and to date, the last one. The citizens of Radiator Springs are having a leisurely parade through the countryside to honour their town's founding, but a couple of roughneck off-roaders show up and challenge Lightening McQueen to a race. McQueen accepts, but Mater gets the directions wrong, so McQueen and the off-roaders wind up going through a brutal off-road race, while the rest of the citizens take their leisurely drive. It's Cars, so you get exactly what you expect. Like the bulk of the Cars shorts, this originally aired on the Disney Channel. Fun trivia fact: this is the only Cars short where Owen Wilson returns to do the voice of Lightening McQueen. In all the other ones, McQueen is voiced by voice actor Keith Ferguson. Lava - A very unusual romance tale, as it's the tale of a romance between two volcanoes in the Pacific Ocean. It's a very sweet tale, with some very lush animation, and I kinda wish they went for a tragic ending instead of a happy one. Everything about this is cute. This was originally in theatres in front of Inside Out. Sanjay's Super Team - As we saw with Coco, Pixar is really starting to explore other culture with their films, and Sanjay's Super Team delves into the Hindu faith. We see a universal struggle, as a father tries to get his son to partake in evening prayers, but the kid just wants to watch cartoons. The kid finally begrudgingly joins in, but soon imagines himself in another world where he meets the various deities and has an adventure with them, and finally makes a connection with his father. This one is very, very sweet, and actually, a pretty universal story about fathers and sons trying to find common ground. This was originally in theatres in front of The Good Dinosaur. Riley's First Date? - More universe expansion with this, the short from the Inside Out Blu-Ray. When a boy shows up wanting to meet with Riley (the girl from Inside Out in whose head the film takes place), Riley's parents start to freak out as they try to figure out whether this is their little girl's first date. And we venture into the parents' heads as they wrestle with this. Again, it's very fun, and features some very good use of AC/DC. Piper - Heralded at the time for being Pixar's most photo-realistic film. We follow the adventures of a sandpiper chick who ventures out to the beach for the first time to hunt for food on his own. But being crushed by the waves a few times soon gives our young sandpiper a literal fear of leaving the next. But, by befriending a hermit crab and watching their behaviour, this young bird soon learns how to brave the waves and find food. Again, very cute, with an incredibly cute leading character. This was in theatres in front of Finding Dory. Lou - Man, Pixar just loves to make characters out of any inanimate object, don't they? This one is about a sentient lost & found box at a playground, who does battle with his arch-enemy: a bully who takes things. I mean, a lost and found is all about giving back, and this bully is all about taking. But, rather than just being all about slapstick antics, this does have a pretty good resolution. After learning the bully's name, the lost and found digs deep and finds a stuffed animal that the bully once lost. The lost and found box says that the bully can have it back once the bully returns everything. And in doing so, the bully learns the joy of giving back. Again, very sweet. This was in theatres in front of Cars 3. Bao - Pixar exploring other cultures continues with this one, rooted in Chinese culture. Specifically, Chinese-Canadian culture, as the director is Chinese-Canadian and, based on the CN Tower in the background of many shots, it's set in Toronto. We see a Chinese woman making some dumplings in the kitchen, and once the husband runs off to work, she is stunned when the last remaining dumpling comes to life. She begins to raise it as her own child. Things are going fine at first, but as the dumpling gets older, and wants to play with his own friends, mother and dumpling son begin growing apart. It all reaches our shocking twist when they have a fight one night and, since her son is just a dumpling, she eats him. Horrified at what she's done, she goes into her room and starts crying. And that's when we get the other big twist. The whole thing had been a not-so-subtle metaphor with how she feared her human son was growing away from her. Mother and son reconcile, happy endings all around. This was in theatres in front of Incredibles 2. There's also a couple of "mini-movies" on the disc. These ones are just two minutes long, shorter than the full 7-minutes or so of the rest of the shorts. The first if Miss Fritter's Racing School, a faux-commerical for the demolition derby seen in Cars 3, and Marine Life Interviews, where the various sea creatures of Finding Dory, do interviews about the film, only for the punchline: Dory, she of very little memory, has no recollection of the film. These were produced for the Cars 3 and Finding Dory Blu-Rays respectively. And thus concludes Pixar's latest collection of short films. Which reminds me, I haven't gone through the bonus features on Incredibles 2 and watched the short film that came with that one. Keep them shorts comin', Pixar. We love them so.